There's real interest out there for growing mushrooms the way we do. We want to allow people to start their projects by offering an online course. Santander has announced this week that GroCycle won one of the bank's Social Enterprise Development Awards (SEDA). The awards are given to social enterprises and trading charities looking to grow their business and improve their local community. 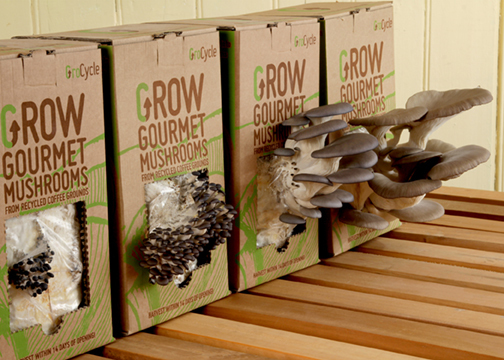 GroCycle pioneers the growing of mushrooms on coffee waste. "This is amazing news! The award is recognition that what we do is important and deserves to be spread far and wide. It is also a great motivator for the team" Said Adam Sayner, GroCycle director. "Growing mushrooms on coffee waste makes a lot of sense in the current global climate." Overall 146 social enterprises from across the UK were given SEDA awards this year amounting to £1.2million in prize money. Alongside the prize money, the winning social enterprises receive a business support package from Santander which includes business webinars, full funded internships, consultancy days and the opportunity to network with other social entrepreneurs and small business owners. Robin Foale, MD, Santander Business Banking said: "Congratulations to this year's SEDA winners from the South West. There are some truly outstanding enterprises and charities in the awards this year. We hope that the money and support programme will help them reach their potential and increase their social impact in their local communities." "We will put this money to good use by using it to further develop our aim of spreading this amazing concept" said Eric Jong, GroCycle director. "There's real interest out there for growing mushrooms the way we do. We want to allow people to start their projects by offering an online course, www.growmushroomsoncoffee.com". GroCycle already have a solid track record in training people to successfully grow mushrooms in this unique way. Hundreds of people took their course at their Dartington base. Some of the alumni have set up small projects across the UK & Norway. "We've developed a lot of expertise and want to put this to good use in an effective way and feel that the online course format will do that" said Adam Sayner. "We'll also capitalise on our recent experience setting up a mushroom growing project in HMP Dartmoor"
"For us it makes perfect sense to spread the technique like this' said Eric Jong, " we aim to get people growing mushrooms everywhere, not just in prisons, it's why we originally developed the UK's first Grow Your Own Kit- using coffee of course!" GroCycle is an award winning social enterprise based in Devon UK. The company pioneers the growing of mushrooms on coffee waste. 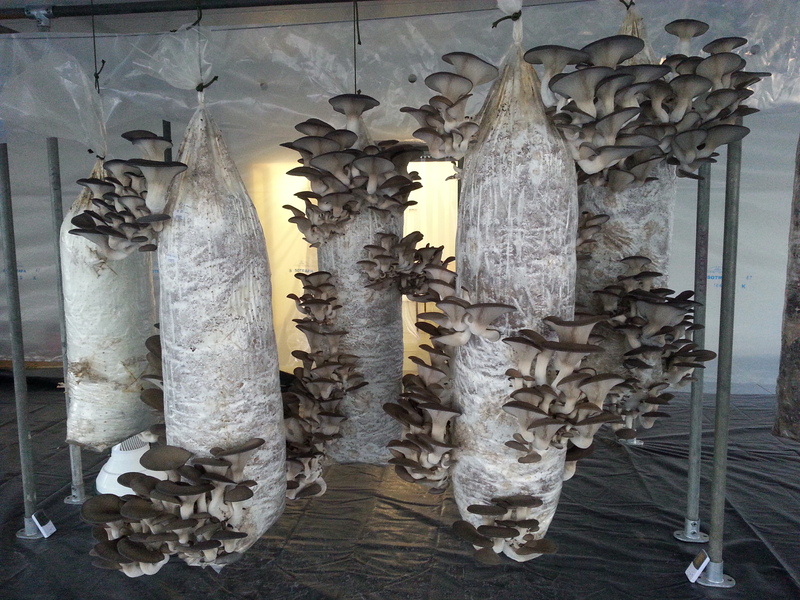 It launched the UK's first GYO Kit, the first Urban Mushroom Farm and has spreading this technique as one of its social aims. Santander is a leading financial services provider in the UK and offers a wide range of personal and commercial financial products and services. Santander serves more than 14 million active customers and has c. 24,000 employees, c. 1,000 branches and 50 regional Corporate Business Centres. -Oyster mushrooms are 15-25% protein (by dry weight). -Oyster mushrooms contain ergothioneine, a unique antioxidant exclusively produced by fungi, according to a 2010 study led by Penn State food scientist Joy Dubost. The study found that oyster mushrooms have significant antioxidant properties that protect cells in the body (www.medicalnewstoday.com/releases/29988.php). -Oyster mushrooms are high in nutrients. According to a study published in "Food Chemistry," oyster mushrooms contain significant levels of zinc, iron, potassium, calcium, phosphorus, vitamin C, folic acid, niacin, and vitamins B-1 and B-2. Grocycle video promo vimeo from nu project on Vimeo.